Alaska Native elders from Bering Sea coastal communities on Friday blasted Alaska's congressional delegation for not doing more to prevent President Donald Trump from striking an Obama-era executive order that gave them a voice on federal management decisions in the region. An attorney for the Bering Sea Elders Group, representing 40 coastal tribes in Western Alaska, said in a statement that Trump's actions Friday to open the door for drilling in the U.S. Arctic Ocean should have stuck only to leasing withdrawals made by his predecessor, Barack Obama. Trump said Friday that his executive order reversed Obama's "Arctic leasing ban." It directed the Interior Department to reconsider actions by Obama that put large swaths of the Arctic Ocean off limits to oil drilling. The tribes say the Obama order was prompted to address the effects of climate change and increased shipping. 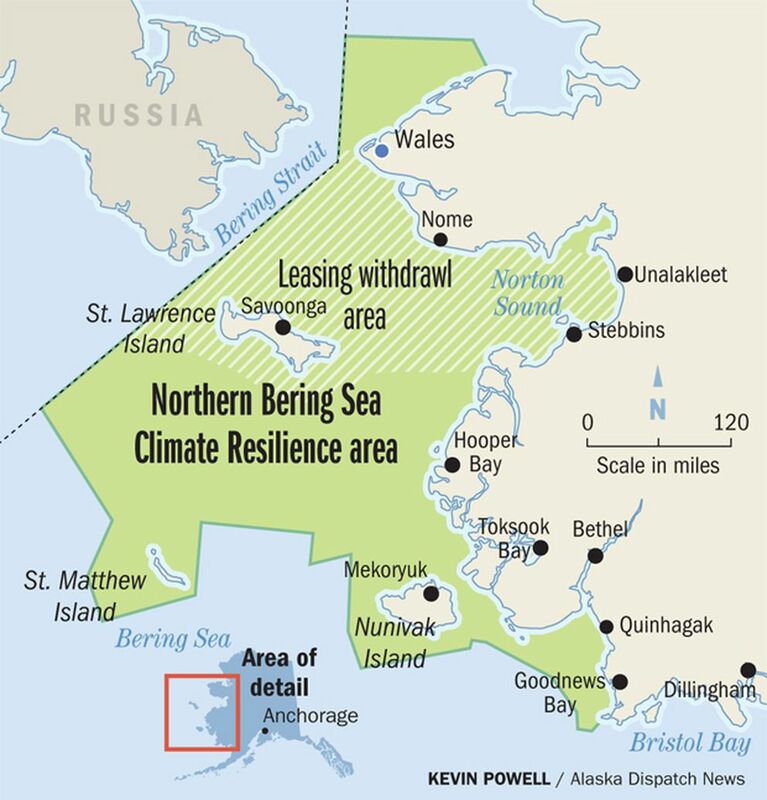 Though Trump on Friday modified actions taken by Obama in 2015 and 2016, he revoked outright only one Obama executive order, "Northern Bering Sea Climate Resilience," signed Dec. 9. That Obama order withdrew waters in Norton Sound and around St. Lawrence Island from leasing. But the Obama order also called for the creation of a tribal advisory council to work with federal managers on decisions across a much broader area encompassing 112,000 square miles, in the northern Bering Sea and in waters around the Seward Peninsula. The council would have consisted of up to 11 members from coastal communities in the area, which included a small chunk of the southern Chukchi Sea. "Now that's totally gone," said Natalie Landreth, an attorney with the Native American Rights Fund, the legal representative for the elders group. One idea behind the advisory council was providing local input to federal managers to prevent conflicts between subsistence hunting and ship traffic in the area. The council, for instance, could have let federal agencies know when ships transiting the region should be re-routed temporarily to avoid walruses and Alaska Native hunters, Landreth said. The order also required agencies to consider traditional knowledge in decisions affecting the area. "Now there is no seat at the table for Alaskans or our local knowledge," said a statement from the group, emailed to reporters Friday by NARF. "Alaska's own congressional delegation stood by as local Alaskan voices were removed from decisions that affect our lives, and now we are at the mercy of federal decision-makers only." "We have depended upon our legislators for help and they did not do their job," said Harry Lincoln from Tununak, the elders group chair. "I feel like they are retaliating against us for getting this order through the previous administration." Rep. Don Young and Sens. Lisa Murkowski and Dan Sullivan were present with Trump in the White House as he signed the executive order. The delegation issued a statement lauding Trump's order for lifting Obama's leasing withdrawals in the Arctic, in the Beaufort and Chukchi Sea leasing areas. The delegation's statement made no mention of the Bering Sea. Members of the delegation could not immediately be reached for comment late Friday. Trump has been blasted for mangling communication with lawmakers in his aggressive effort to rewrite Obama's policies within his first 100 days, a period that ends Saturday. It was unclear on Friday whether the delegation knew that Trump planned to revoke the Bering Sea order, or when he might do so. The elders group was formed about seven years ago, said Landreth. It was created to protect traditional Native practices and the ocean-dependent ecosystem in the Yukon-Kuskokwim and Bering Strait region in Western Alaska. The group's website lists more than 35 people on its elders board. Landreth said the group had advocated for the order from Obama for two years. The Association of Village Council Presidents and Kawerak, regional nonprofit corporations representing dozens of villages in Western Alaska, also pressed for the order, the group's website says. In its statement, the elders group said that in January it met with the Alaska delegation to let them know that villagers from the communities had written the terms in the order. The Native group said the delegation had agreed to notify communities in the area if revocation of Obama's order was even being considered. "We were never contacted," the group's statement said. "Everything we have worked for has pretty much gone out the window," said Frank Oxereok, from Wales and an elder from the group, in the statement. "Indigenous people rely on resources in areas that we live." Oxereok singled out Murkowski, chair of the Senate Energy and Natural Resources Committee, for particular criticism. "This may destroy our way of life and I'm really disappointed in Lisa Murkowski, who was standing next to the president when he signed this order," he said. "Senator Murkowski would never stifle anyone's input into any decision-making process," Murkowski press aide Karina Petersen said late Friday.